The dreaded writer’s block. Many people have covered this topic but I thought I would add to the conversation by showing you the methods that I’ve found that work for me ( + a few that don’t). Just to be clear. I have often found that the phrase writer’s block is used to mean that people ‘weren’t inspired’, or that they didn’t know how to start so they decided that it was writer’s block at fault and not that they needed to do some hard work. Writing is hard. It doesn’t all come to you fully formed. I believe a lot of people use writer’s block as an excuse for procrastination, as if it’s ‘not their fault’ that they ‘can’t’ write anything. I believe that’s a load of b*ll*cks. If you want an excuse to not write then that’s fine, but own up to doing it. 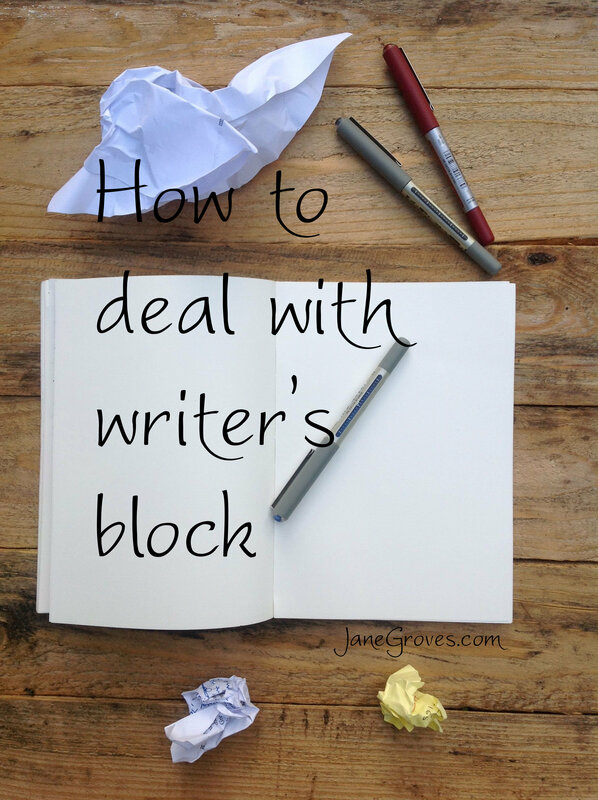 To me, writer’s block is that time when you’re stuck. All of your ideas seem stupid but you can’t think how to do it ‘right’. You know where you want to end up but you have no idea how to get there. That time where creativity seems to have sped off out the window to have tea with someone else. Writer’s block exists, but I don’t believe in letting it be in charge of you. These are some of the things I do to try and shake it off. There’s something about paper that gets my brain working differently. I spend most of my time on a computer typing away, but if I’m truly struggling with writer’s block then I grab a notebook and start writing. I let it be disjointed and messy. I let myself write down questions even when I know I don’t have an answer yet. I let myself question the questions, argue with myself on the paper. I let myself write down the things I’ve already dismissed in my head. Seeing these things written in my messy handwriting helps me think around problems and develop new ideas. Sometimes I find grabbing a coloured piece of paper and scribbling all over it helps me get some ideas moving. If I have no coloured paper than any paper will work but I find that coloured paper gives me that extra bit of zing that’s sometimes needed. I think it’s because it looks completely different to everything else that I use. As it feels less formal I don’t worry about putting any ‘stupid’ ideas down. Self editing before I put it on paper never helps me get unstuck. It all gets thrown down in a mind-map no matter how silly. It’s amazing to see how the ideas all come together like puzzle pieces. If you haven’t tried this then grab an A4 piece of paper and give it a go. Make it messy. Make it pretty. Draw lines everywhere. Put your question or whatever it is you’re stuck with in the middle and then put anything you can think of around it. You’ll figure out how it connects once it’s drawn in front of you. Scents seem to trigger creativity for me. Cooking lets me keep my hands busy while my brain is free to think while I’m creating smells I like. I’ve had a number of ‘oh of course’ moments while cooking. If you want to try this method you could also use aromatherapy. Personally I like having the bonus of making a yummy snack, but whatever works for you. Here’s a tip – while you’re cooking you need something near you to write your ideas down on. You don’t want whatever you were cooking to burn while you write down your brilliant idea! I’ve heard time and time again that ‘sleeping on it’ helps people. They go to sleep feeling lost and wake up knowing what to do as their brain has been working on it all night. Well frankly, I’m jealous of that. Sleeping on something has never helped me get unstuck. Sometimes it will give me perspective on something that I’ve already thought of, but it never gives me new ideas. If I have writer’s block now, I will have it after a nap. One of the reasons that I love stories in all their forms is that I immerse completely in them. I disappear into them and give them all of my attention. Time disappears when I’m reading. I had a flatmate who (I discovered to my embarrassment) would watch me instead of the TV as he found it fascinating to watch the emotions cross my face as I became completely wrapped up with what was on the screen – even when I didn’t really like the show. I fall into stories and ignore everything else. This is wonderful when I want to have a break from something, but when I’m trying to deal with writer’s block it’s of no help. I’ll be in exactly the same place I was in before but have now lost the minutes or hours that I gave to the story. My brain has no new ideas and in fact it’s a little sluggish in getting back to writing. Sometimes you read articles about people you admire and they give tips about what works for them. That’s great, new things to try! What doesn’t help is when I try and mimic their methods completely. Yes, it may work perfectly for them, but they aren’t you! Some of the ideas may work, some won’t, and some may require tweaking to be right for you. You have to find your own way. By all means, try a new method. Experiment. Learn new things about yourself. But that is the key – LEARN. If something doesn’t work, don’t do it. It’s great that it works for some other famous or inspiring person, but if it doesn’t work for you dump it and try something else. So there you go. That’s what works (and doesn’t work) for me when I’m struggling with the dreaded writer’s block. What about you? Got any methods that I’ve not listed?